Rooting your Android device can bring a lot of benefits by giving you deep system access. But Google is making it more and more difficult to root Android with each update. Also, it is getting harder to enjoy the full benefits of root access without sacrificing something in the process. Like losing access to certain apps, which includes banking, payment and corporate security apps that work with financial and confidential data. The reason is SafetyNet. If you modify anything on your system partition, SafetyNet will trip. The apps like Android Pay, Pokemon Go, Snapchat and now even NetFlix won’t run. The app use API. This API is used for example in Android Pay, some banking apps and Pokémon GO. It will trip if your Android “tampered with or otherwise modified”. Yes, Thanks to Android’s open source nature and hardworking, passionate developers, almost nothing is impossible if your device is rooted. So, you can have root access and still pass SafetyNet check. All you gotta do is change rooting method. You will need to remove SuperSU and replace it with MagiskSU. Root via topjohnwu’s MagiskSU instead and enjoy all the benefits or rooting systemlessly. You’ll also need to uninstall any mods. So, let’s do it! To uninstall SuperSU, Launch it. Go to Settings and scroll down and tap option that says Full Unroot. 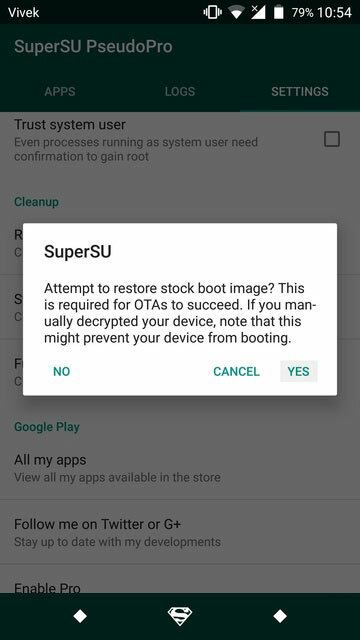 Hit yes, when prompted, if you would like to restore the stock boot image. Next, you will be asked if you want to restore the stock recovery image as well, tap No. The unrooting process takes only a few seconds. If you have the Xposed Framework installed, you’ll need to uninstall it. Don’t worry because it can be installed again without modifying system files via Magisk. To uninstall Xposed, go to the Framework section in the Xposed Installer app and tap Uninstaller. This might take a while, Reboot when finished. SafetyNet will still stay tripped if you have any other mods installed or have made any changes to the system partition. You can activate them again after rooting with Magisk. The best way to restore your system partition would be to re-flash the stock system image for your particular phone using Fastboot. You may have to re-flash the entire stock firmware. Magisk does not support every Android device. If your device is not supported, you might get stuck in a boot loop. So make sure you take a full Nandroid Backup before installing Magisk. 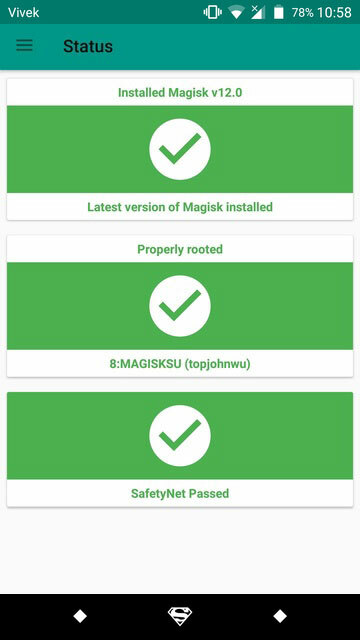 Download the latest Magisk Installer zip. Make sure to check out the xda thread for the latest version. Transfer the downloaded zip to your Android device. Reboot your device to recovery mode. Your device was rooted so you should know the game. From Recovery Menu, select Install and select the Magisk zip. Flash it! The installer modifies the boot image of your device and creates a new magisk.img partition in your smartphone’s root directory. It also places necessary files in /cache and /data partition. Once Magisk is flashed, you’ll see the Reboot System option, tap on it. Go to the Magisk Manager app and head over to Settings. Enable BusyBox, Magisk Hide, and Systemless hosts and head back to the Status section. Tap on the SafetyNet check button/card at the bottom. It should say SafetyNet Passed. In order to use apps like Android Pay, NetFlix, etc. on your rooted Android device clear play store data. Go to Settings > Apps and select the Google Play Store. Tap on the Force Stop button then go to Storage and select CLEAR DATA. You should see your device reported as Certified under Device certification. You can download Xposed and any other Magisk compatible mods from the Download section in the Magisk Manager app. Remember not to use any root apps or mods that modify the system partition in any way or you’ll end up tripping SafetyNet again. Go for Magisk mods only.